Photograph: Martha Williams"Portuguese" rock hen on the Topolobampo Mexico City 1671 menu. Photograph: Martha WilliamsSaffron rice on the Topolobampo Mexico City 1671 menu. Photograph: Martha WilliamsQuail tartaleta on the Topolobampo Mexico City 1671 menu. Photograph: Martha WilliamsStreet food 1671 on the Topolobampo Mexico City 1671 menu. Photograph: Martha WilliamsPork in clemole on the Topolobampo Mexico City 1671 menu. 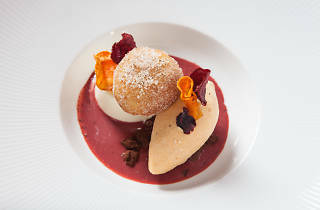 Photograph: Martha WilliamsRicotta fritter, carrot ice cream on the Topolobampo Mexico City 1671 menu. Photograph: Martha WilliamsPlantain ante on the Topolobampo Mexico City 1671 menu. 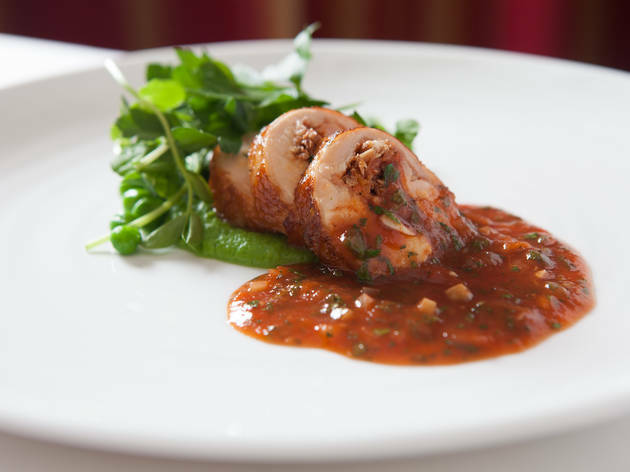 "You could call Mexican cuisine the first great fusion cuisine," Rick Bayless says. 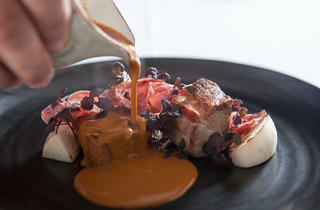 "It's a total fusing of Aztec and Spanish cuisines and it became its own unique food." 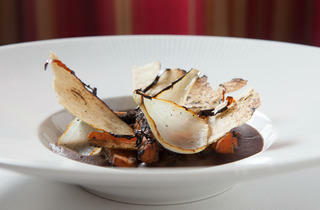 This year, Bayless is exploring Mexican culinary history through a series of menus at Topolobampo. 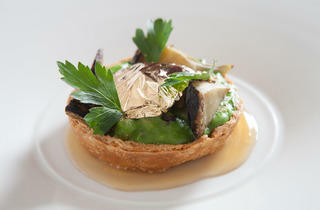 He began with Mexico City 1491, a seven-course menu comprised entirely of dishes made from pre-Columbian ingredients. The current seven-course menu, which started earlier this month, runs through May 24 and focuses on Mexico City, 1671, a year that's well after the Spanish conquest in the 1500s. 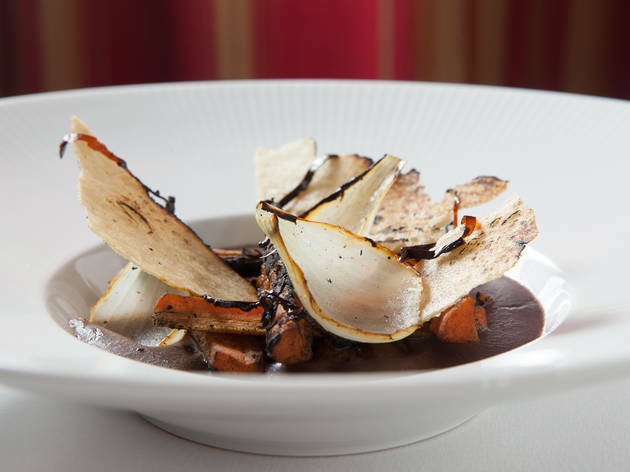 The menu only uses ingredients that would have been available in Mexico in 1671, and to come up with recipes, the Topolobampo team drew on Bayless's massive cookbook collection and recipes from Sor Juana Ines de la Cruz, a nun who lived during this period. 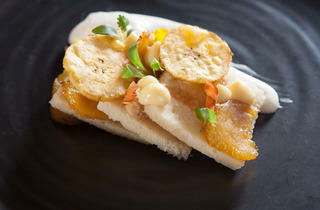 "We asked ourselves, 'What did Spanish food taste like when it was made in the New World with New World ingredients?'" Bayless says. "They brought a few things with them from Spain and... the native population of Mexico had an amazing amount of agriculture and a very complex agricultural system. Mexico City had a million people living in it and they would have had to produce a lot of food. We asked what food would taste like after the conquest, and wanted to give it time to settle in. We could have done the end of 1500 but we did the end of 1600." After eating the menu and talking with Bayless, here's what we learned about the history of Mexican cuisine. 1. When the Spanish conquistadors arrived in New World, they brought ingredients and dishes from home, which melded with Aztec recipes and ingredients. When the Spanish began cooking in Mexico, they were making their own recipes, but with Mexican ingredients—"it's like speaking Spanish but with Aztec words," Bayless says. 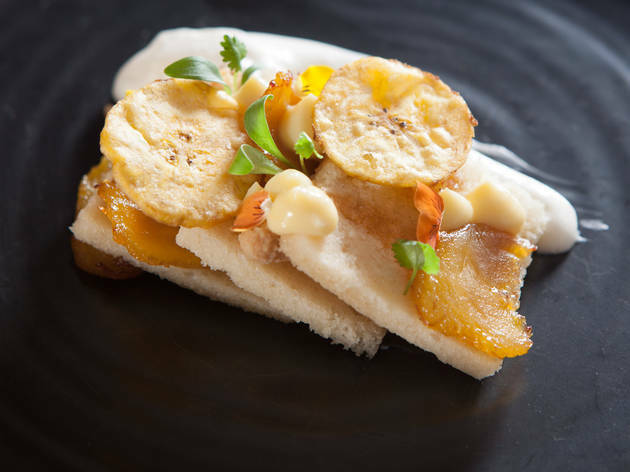 "Their approach in the kitchen was the same, but it was expressed with local ingredients like plantains and pineapples and made into things that were classics in the Spanish kitchen." 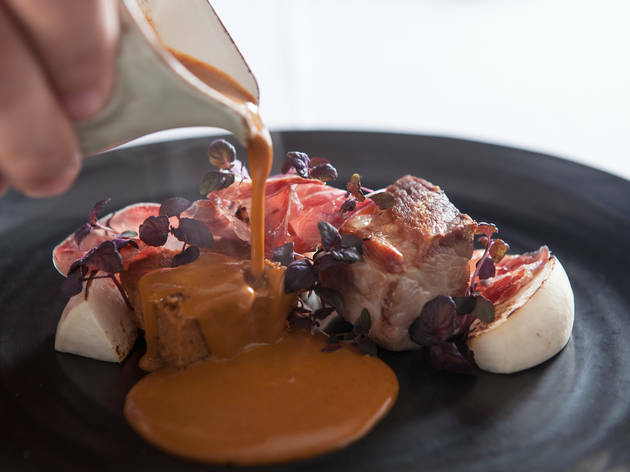 Bayless says that one sauce on the 1671 menu, the luxurious clemole that's served with pork shoulder, is "a perfect fusion." It's made with Spanish ingredients (nuts, red wine) and Mexican ingredients (chiles) and with techniques from both cultures. 2. In other places, Spanish conquistadors wiped out native traditions. "We titled this menu 'Collision Course,' since it's a collision between Spanish food and native Mexican food," Bayless says. "It was like the two things were just going to battle. But in other places in South America, like in Lima, basically the conquistadors wiped out the native population and set up shop there. There was no collision course, it was all Spanish." 3. Many more ingredients became available between 1491 and 1671. The 1491 menu couldn't use dairy, sugar, wheat, chicken, pork and many other ingredients. 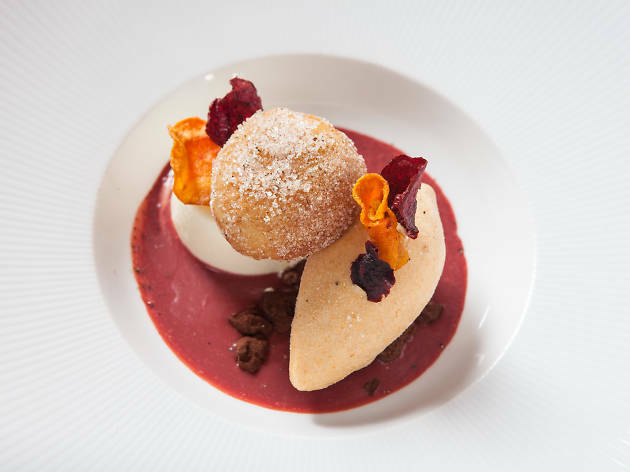 By 1671, the Spanish had brought over domesticated animals and the new menu reflects these additions, in dishes like a ricotta fritter with caramelized carrot ice cream, one of the two desserts on the menu. The pork clemole also included a bread pudding made with the same ingredients in the sauce and it tied the different flavors on the plate together. "It was really fun for the kitchen to start cooking differently," Bayless says. "It feels like we changed restaurants. The menus are so different that it shows what happens when one country conquers another. It changes the way they eat." 4. A Mexican-Spanish nun is responsible for some of our knowledge about food during that time period. Sor Juana Ines de la Cruz is most famous for being a poet, but the nun also loved food. "She was really given to the kitchen and she thought that food was the most direct way to experience nature," Bayless says. "She also left behind a bunch of recipes." 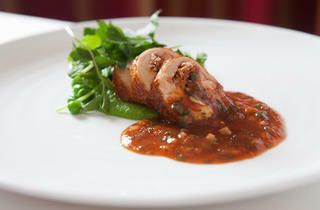 That includes a dish called "Portuguese" chicken, which appears on the Topolobampo menu. "It's got peas, it's got tomatoes, a New World product the Portuguese latched onto," Bayless says. "The spices are sweet spices like cinnamon, star anise, mint, which when muddled with tomatoes creates what we think of as a medieval-tasting sauce, because it was really influenced by medieval Spanish kitchen." 5. Mexican cuisine was continually evolving. 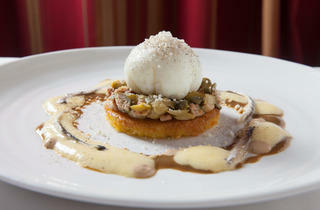 Upcoming menus will continue to trace the cuisine's evolution into what we recognize as Mexican food today. The next menu will focus on dishes inspired by Topolobampo's art collection, and the menu after that will be 1831, the year the first cookbook was published in Mexico, of which Bayless has a copy. Then, 1930, which is post-1910 revolution, a menu Bayless says will be the "first time Mexico took on a completely different character from the shackles the Spanish had left." 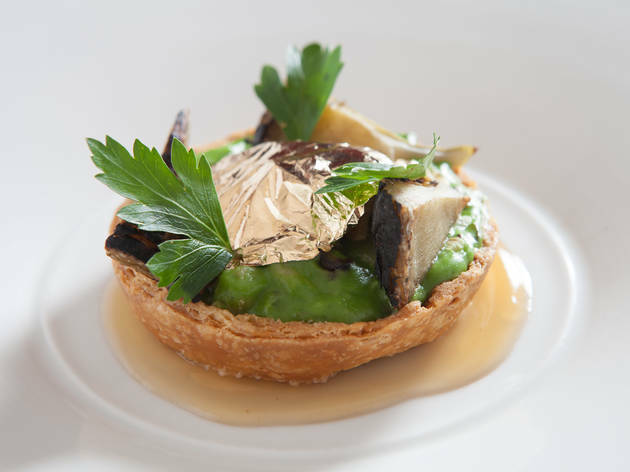 The 1671 menu is available every night along with a la carte offerings, and is $120. You don't need to request it in advance. Spanish and Portuguese wine pairings are $80.